Sitting alongside one of the largest man-made lakes in Europe, Rutland Water Golf Club offers the golfer 18 holes on the championship Normanton Course and 9 par 3 holes on the Hambleton course. The club did have standing water issues on greens, but following the acquisition of a Sisis Javelin Aer-Aid 1500, Head Greenkeeper, Dan Wren reports a dramatic improvement. The tractor mounted Javelin Aer-Aid 1500 not only aerates with a vertical action, but also injects air into the root zone at a fast working rate, creating thousands of fissures. The cam trigger mechanism ensures that the air is always expelled at the bottom of the tine penetration, enabling treatment to be targeted precisely and consistently. The overall result is reduced compaction, healthier growth and the reduction in the need for fertilisers and pesticides. The 10mm diameter ‘tipped’ tines are spaced at 75mm (3ins) with depth of penetration infinitely variable to a maximum of 127mm (5ins). These air injection tines are specially designed to use the maximum air available from the compressor and produce clean, fresh air at a constant rate of 88 litres or 3cu ft. per minute. Surface disturbance is kept to the minimum after operation. The Javelin Aer-Aid 1500 has a working width of 1.5 metres, and is very quiet in operation and can be powered by as little as a 30hp tractor. 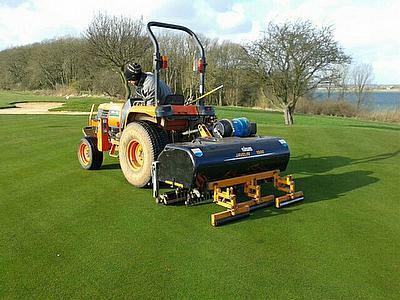 Used at the correct speed and depth, it can aerate an average sized golf green in under twenty five minutes, leaving an even finish that can be played on immediately afterwards. Alternative tines for other operations, such as hollow coring before top dressing, are also available.